Last week, Dr. Michelle Christie, Founder and Executive Director of No Limits for deaf children, was selected as one of the 2017 CNN Heroes. No Limits is humbled to be recognized, and we are overwhelmed with gratitude for the outpouring of support and personal stories from the community of how No Limits made an impact in your lives. For the past 20 years, No Limits has taught school-age children with hearing loss the skills to succeed in school and in life through its educational centers and national theater program. The families who attend our program cannot afford speech therapy and minimal services are provided by the schools, so we are able to provide a comprehensive after-school program that offers individual therapy, literacy, academic tutoring, and parent education. It is our goal to help children with hearing loss communicate, whether they speak, sign, or do both. No Limits gives them the tools and support to believe in themselves and realize their dreams. Through our parent education classes, our families learn about hearing loss, advocacy skills, policy and legal rights as well as the benefits of the Deaf culture and Deaf Community. We are proud to introduce our children and families to Deaf role models, including our college alums. Most of our children learn to sign as they become older so they communicate using both spoken and sign language. No Limits has a passion to unite, not divide. We hope this recognition by CNN Heroes serves as an opportunity to facilitate a dialogue about how we can all come together to support children with hearing loss and help them succeed. 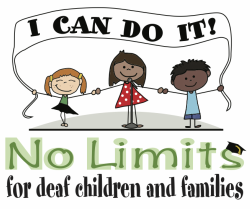 No Limits was founded in 1996 by Michelle Christie, Ed.D. Recognizing the lack of opportunities for children with a hearing loss to improve their speaking abilities in a fun and non-academic setting, Dr. Christie designed an after-school theater program to help develop communication skills, expand vocabulary and grammar, and understand character development. Through role-playing, cultivating creativity, and developing public speaking skills, No Limits children began to confidently move into the hearing world. After witnessing dramatic improvements in the children and receiving countless testimonials from families, peers, educators and the community at large, No Limits expanded to become a national program. To date, No Limits has produced over 100 original shows in 13 states, with over 200,000 audience members witnessing the accomplishments and talents of these inspiring children. No Limits had the distinct honor of making history as the first time deaf children who speak performed at the prestigious John F. Kennedy Center for the Performing Arts and recently made history with its hit production Silent NO MORE at the world-renowned Carnegie Hall in New York City. As a result of its remarkable success, No Limits extended its program beyond the theatrical arts to provide auditory, speech and language training year-round. In 2002, the No Limits Educational Center opened in Culver City, California. The Center provides services for low-income school-age deaf children and their families. Services include: individual therapy, academic tutoring, literacy, STEM, arts enrichment, parent education, audiological services, and a Leadership and Mentoring Academy for teens. In 2013, No Limits opened an additional after-school center in Las Vegas, and most recently, in Oxnard, CA, pioneering the expansion of its services to reach more communities. As a result of the comprehensive No Limits program, children who are deaf or hard of hearing are learning essential skills that will allow them to attend college and become successful, productive members of society.